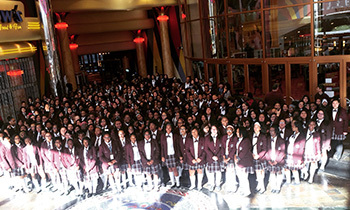 Houston Attorney Michael Harris paid for more than 700 students from Young Women’s College Preparatory Academy and Mickey Leland College Preparatory Academy for Young Men to see the movie “Selma” on Jan. 28, so that they could learn more about the civil rights movement. Mickey Leland Principal Dameion Crook was happy his students had a chance to see the movie, which chronicles the period in 1965 when Dr. Martin Luther King Jr. led a march from Selma to Montgomery, Ala., that resulted in President Lyndon B. Johnson signing the Voting Rights Act of 1965. This entry was posted in District II - Rhonda Skillern Jones, District V - Sue Deigaard and tagged Mickey Leland College Preparatory Academy for Young Men, Selma, YWCPA on January 28, 2015 by HISD Communications.